A total of 16 teams will skate in the 2014 NHL playoffs, but only one will raise the Stanley Cup. The 2014 NHL playoffs get underway on Wednesday, April 16th. You can follow all the action with the 2014 NHL playoff bracket. The 2014 NHL playoff bracket is printable and instantly downloadable right here on this page. 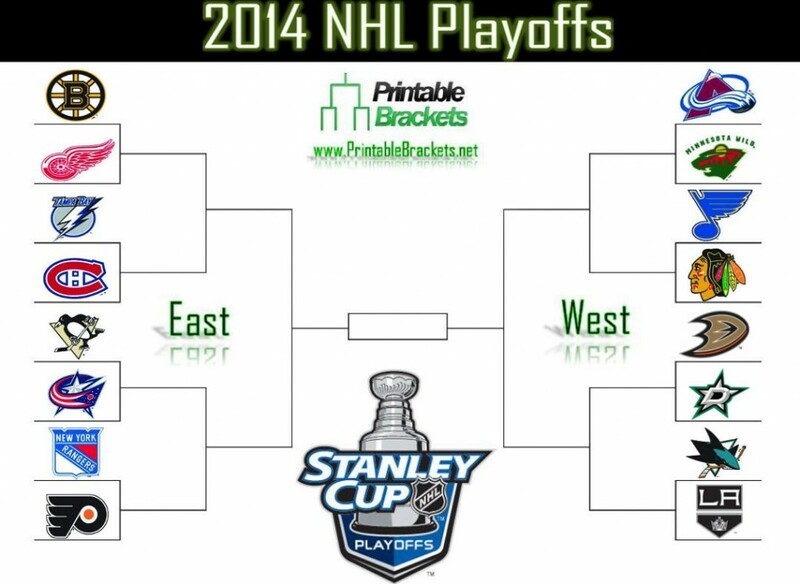 Simply click on the download link to get your copy of the 2014 NHL playoffs bracket today! The defending Eastern Conference champion Boston Bruins enter the 2014 NHL playoffs with the most points of any team during the regular season. Boston, which lost to the Chicago Blackhawks in last year’s Stanley Cup Final, captured the Presidents’ Trophy after collecting 117 points. The Bruins, who also won the Atlantic Division title, will meet the Detroit Red Wings in the first round of the 2014 NHL playoffs. Detroit is appearing in the Stanley Cup playoffs for the 23rd straight year. The winner will collide with the winner of the series between the Montreal Canadiens and the Tampa Bay Lightning. Also in the East, the Metropolitan Division champion Pittsburgh Penguins will skate against the Columbus Blue Jackets, while the New York Rangers will renew their rivalry with the Philadelphia Flyers. The defending Stanley Cup champion Chicago Blackhawks enter the 2014 NHL playoffs as a three seed after finishing third in the Central Division. Chicago will open defense of its title against the St. Louis Blues. The Colorado Avalanche comes into the 2014 NHL playoffs as the top seed in the West. Colorado captured the Central Division crown with 112 points. The Avs will open up the playoffs against the Minnesota Wild. Also out West, the Anaheim Ducks will do battle with the Dallas Stars; while the San Jose Sharks will square off with the Los Angeles Kings in round one of the 2014 NHL playoffs.